Judging the distance of birds in flight is among waterfowling’s greatest challenges. Shooting out of range or skybusting is one of the greatest disservices to fellow waterfolwers. In this guide, we’ll discuss the best ways to judge distances of ducks and how to implement them in the duck blind. The key to bagging more ducks is to know the limitations of your shooting ability combined with your shotgun and ammo. These limitations will determine the effective range that you should be attempting in the field. The effective range is often decided by pellet size and density. Pellet selection determines how far your pattern will stay tight and deliver enough knock down power at long ranges. Steel shot is not the best choice for long range shotgunning, at least not with any sort of regularity. Yes, some long shots have been made with steel, but material that is denser than steel, such as hevi-shot and other tungsten based materials are far better for extending range. Steel shot range can be increased by switching to larger pellet sizes (think BB or BBB), but this often comes with decreased pellet density. There are only so many steel pellets that can fit inside a shotgun shell, and at some point you reach the point of diminishing returns with larger pellet sizes. The pattern becomes too thin to be effective at long ranges. Steel shot works best inside 40 yards. Anything more and the pellet energy drops off considerably, as well as the pattern density and distribution. Heavier than steel alternatives such as Hevi-shot, Tungsten Super Shot, Bismuth, Heavyweight, and Kent Matrix can extend a hunters effective range past 50 yards. Pro Tip: Pattern your shotgun using these tips to find out which loads and choke combinations work best out of your gun. 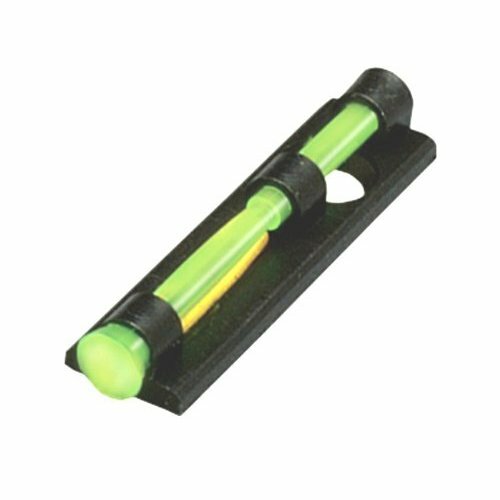 The HIVIZ Competition Fiber Optic Sight can help you stay on target. Longer ranges change the amount of lead required to deliver pellets onto the target. Excluding bird flight speed and angle which poses other challenges, longer ranges typically require longer leads (up to 5ft in some cases). This is especially true for steel shot which tends to start out fast (1500fps at the muzzle), but slows down just as fast. Beyond 40 and 50 yards, steel shot slows down considerably faster than a heavier non-toxic pellet that retains energy and speed for greater distances. Judging the lead for ducks accurately in order to put pellets on target is a split second decision that is often accomplished with little forethought, and relies heavily on muscle memory, instinct, and years of practice to perfect. First week ducks tend to come right in, whereas late season birds shy away from decoys and calling. Passing shots on waterfowl greater than 50 yards with heavier than steel alternatives takes a lot of experience to master. Understanding what your gun and load combinations are capable of will determine your effective range. Limiting your shots to this range will prevent you from being labeled a skybuster. I’ve always been told that the best range to shoot ducks at is the moment you can make out their eyes. Another old adage states that proper range is when you can make out all the non-dominant colors. Whichever you consider the best method, they both rely on birds being close before you take the first shot. Weather conditions can cause havoc with these methods, as a foggy or overcast morning will make it difficult to see color. Whereas a bright sunny day will allow you to see color from a long distance. A visible horizon helps to serves as a reference point for judging distance. An open sky tends to make waterfowl appear a lot further away than they really are. Using natural features around you to help judge distance will help you determine your max range under various conditions. Bird size is another indicator that’s used to estimate the range of waterfowl. Ducks and geese come in many different sizes, but standard sizes you see over and over can help develop a yardage indicator based on instinct. After all, calling the shot almost always comes down to instinct and using past experience to judge what’s acceptable. One method that tends to work often for ducks is to place a decoy at 40 yards or the maximum distance you plan on shooting. This can be easily walked off without having to measure and you’ll have a distance marker for the entire hunt to reference. A confidence decoy such as a heron or egret works even better for this purpose. Timber hunters often have several advantages available to them for judging range that other duck hunters do not. The nature of timber hunting means birds are naturally closer as they dip into a hole in the canopy, and the trees also give a backdrop as a reference for estimating range. Pro Tip: Having trouble getting dabbling ducks to decoy in close? Use these tips on your next hunt for more success. Judging the lead for ducks accurately in order to put pellets on target is a split second decision that is often accomplished with little forethought, and relies heavily on muscle memory, instinct, and years of practice to perfect. Optical range finders can be helpful in determining how far to lead a duck. Using a range finder on decoying ducks is hard to accomplish since they are fast moving objects and it’s difficult to switch between it and your shotgun, but you can use it to range nearby landmarks to help you gauge distance. Any cheap model of range finder will work for determining distances, and you might already have one for deer or turkey hunting. I like to use range finders on ducks that circle but won’t commit to give me an idea of how much further they need to come down for a shot. Range finders are available in two different models: laser and split-image models. These handy tools are easy to use and work well in low light conditions. The split-image range finders are considerably cheaper and work well for duck hunting. They were initially developed for deer and turkey hunters, but the comparable ranges translate really well for duck hunting applications. Range finders can help you determine the best choke tube for the distances you are shooting. Full chokes keep patterns together the furthest, while cylinder chokes have open constrictions suited for close up hunting such as in timber. 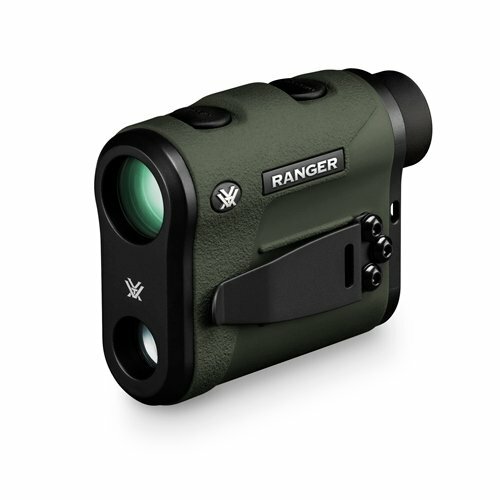 The Vortex Optics Ranger Laser Rangefinder takes the guesswork out of judging the distance of ducks. Knowing your max range and the limits of your ammo and ability is what sets experienced waterfowlers apart from the rest. Refusing to skybust or extend your range beyond what you’re comfortable with is the mark of a true sportsman. In order to estimate the range of ducks, it’s important to know what your effective shooting range is. Steel shot is effective within 40 yards on average, but other non-toxic loads such as Hevi-shot can extend your range past 50 yards. Pellet size and density are the biggest factors to consider when determining your maximum effective range. Determining the best lead for ducks is dependent on many factors including ammo selection, flight speed, angle, and distance. Judging the lead for ducks accurately in order to put pellets on target is a split second decision that is often accomplished with little forethought, and relies heavily on muscle memory, instinct, and years of practice to perfect. The best ways to judge the distance of ducks in flight are to wait until you can see their eyes, look for non-dominant colors that only can be see an close ranges , set a duck decoy or confidence decoy at the max range your comfortable shooting, and using a range finder to distance landmarks near your blind. Implementing these strategies will help you judge the distance of waterfowl on your next hunt. Knowing your limitations, becoming proficient in judging range, and staying within them is the true mark of a sportsman. Looking for a new shotgun sight to help judge distance better? Check out our guide here!